As an emerging economic power, Asia is currently the most dynamic region in the world from the business viewpoint. In the development scenario of the Pacific area, Australia is taking on a increasingly significant role. D.B. 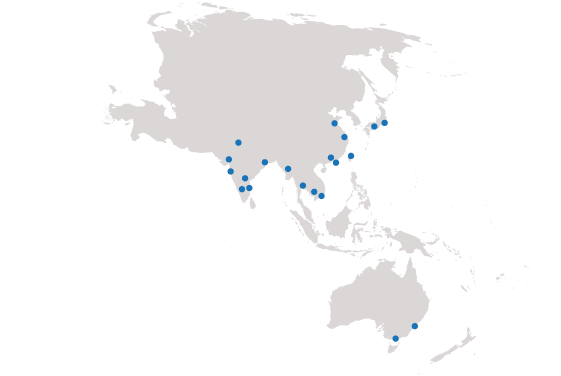 Group has offices across the continent with 12 branch offices in India, China, Japan, Cambodia, Vietnam, Taiwan and Myanmar and a widespread network of agents. Since 2005 D.B. Group has had a presence also in Oceania, with branch offices in Sydney and Melbourne. In recent decades China has been the “symbol” of the fast-changing economy. It is now becoming a strategic market for the consumption of luxury products, and a primary target for brands of many sectors. According to some analysts, in 2015 half of the money spent on the world’s luxury market came from Chinese wallets. With more than 250 million total inhabitants, Indonesia is at 4th Country worldwide for population. It is a nation of contrasts and rich cultures, with influences deriving from a mix of Chinese, European, Indian and Malaysian. Thailand has always been considered as a strategic gateway to Asia, and now its economy is opening up to foreign investments and the country is rapidly developing its infrastructures. In this extremely favorable environment, D.B. Group offers both consultancy and support from its office located in Bangkok. D.B. Group supports customers in Taiwan through its branch office in Taipei, the country’s capital city and an example for the entire surrounding geographical area. D.B. Group manages the customer supply chain in Cambodia with the support of the branch office of Phnom Penh, Cambodia's political and economic capital, as well as the country's largest and most populous city. D.B. Group supports customers in Myanmar with its branch office in the city of Yangon. The offer of integrated logistics services that characterizes D.B. Group the global provider, is thus synergistically strengthened thanks to the particularly strategic geographical position of Myanmar, located between India, China and ASEAN countries. D.B. Group offers advice on supply chain management and integrated logistics services in Vietnam through our branch in Ho Chi Min, a city with some 8 million inhabitants, the most populous in the country. As the world’s third-largest economy and, together with the USA, the largest fashion and lifestyle market worldwide, Japan is a land of opportunity for companies ready to take up the challenge. India is expected to achieve a the best growth rate among the BRIC bloc, while other member countries are expected to see stable growth. Australia is the standard-bearer of development on the Asia-Pacific scene and the D.B. Group has had a presence there since 2005 with two branch offices in major cities of Sydney and Melbourne. It is a dynamic outlet market for many kinds of products.